This is the house that VBC built. Actually, it is house number 30 for Cambodian NGO Volunteer Building Cambodia. By western standards, it is a humble abode. But the nine member family (two adults and seven children) who moved into this new home had been forced to spend some time living in the chicken shed, which was not much more than two metres by two metres, after their house blew down in a storm. The villagers built them a temporary dwelling but they were unable to afford to build something bigger or more weather-proof. So they were put onto VBC’s list of families in need of a home. 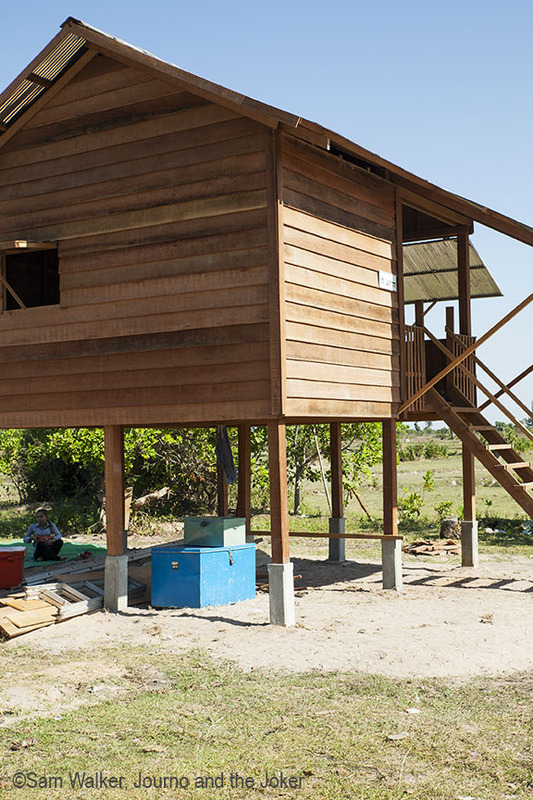 It is a pretty rural setting about 30 kilometres out of Siem Reap. But the family’s main income is rice, on a small plot that barely yields enough to support them. This is the couple who took ownership of this home. But no family will move into a new home until the house has been blessed. 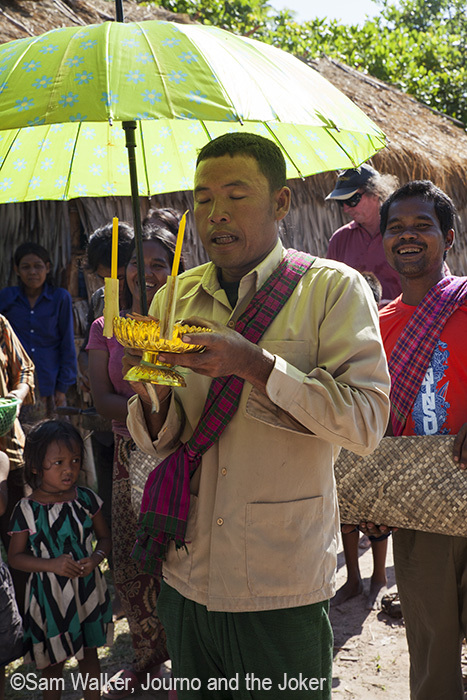 And there is an official house blessing ceremony that takes place. Neighbours and extended family come along and a village elder or official leads the proceedings, which start with everyone walking around the house three times. After some formalities with the village elder, the monks join the celebration. Their chanting is almost hypnotic. It would be great to meditate to. Water is flicked on the couple and around the home. But it is not all serious business. 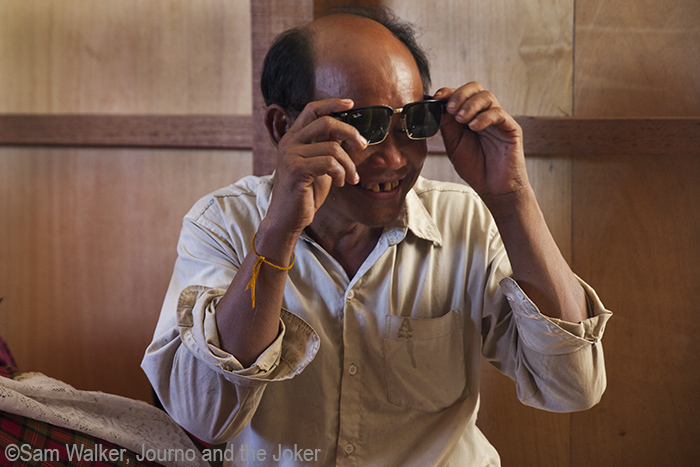 In true Khmer style there is plenty of room for laughter and frivolity. 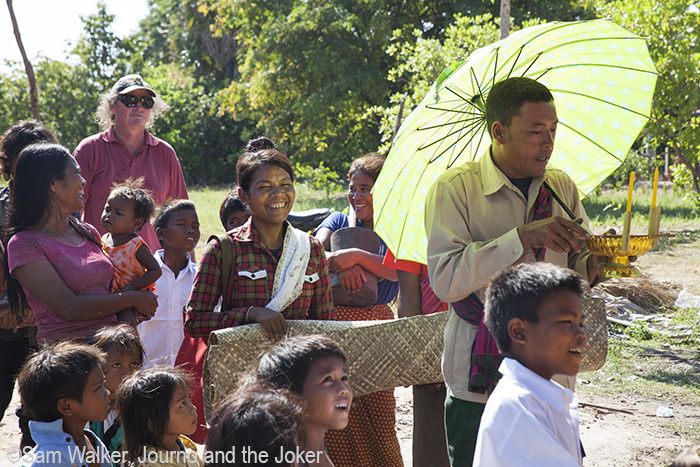 The Joker has gained deep satisfaction in being part of a project that has made such a difference. It is rewarding knowing that someone’s life will be improved through your actions. This is just one family in a country where so many need a helping hand. Great post. Hope you’ll be doing more photo essays. 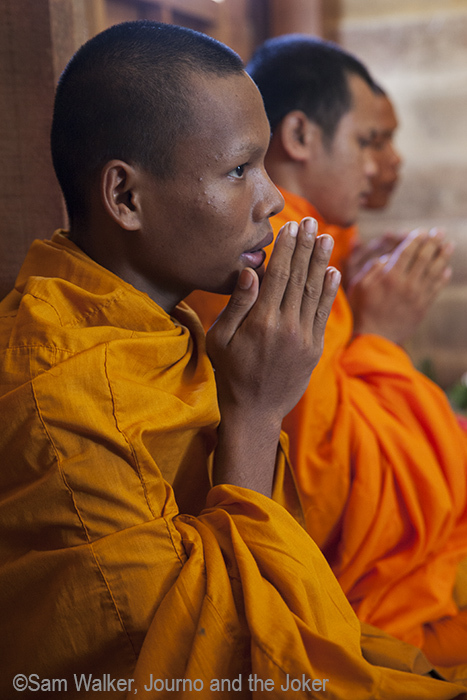 I have a friend who was in Peace Corps in Cambodia for a few years and loved it. Would love to read about/see more stories of the culture and any rituals they might perform. The former anthro student in me is intrigued. Hi Priscilla. I’m glad you enjoyed the photo essays. Yes, I’m definitely planning to do more. I’ve got one in the works now. It’s all about finding the time to shoot, edit and write. The cultural aspects of the country are incredibly interesting. 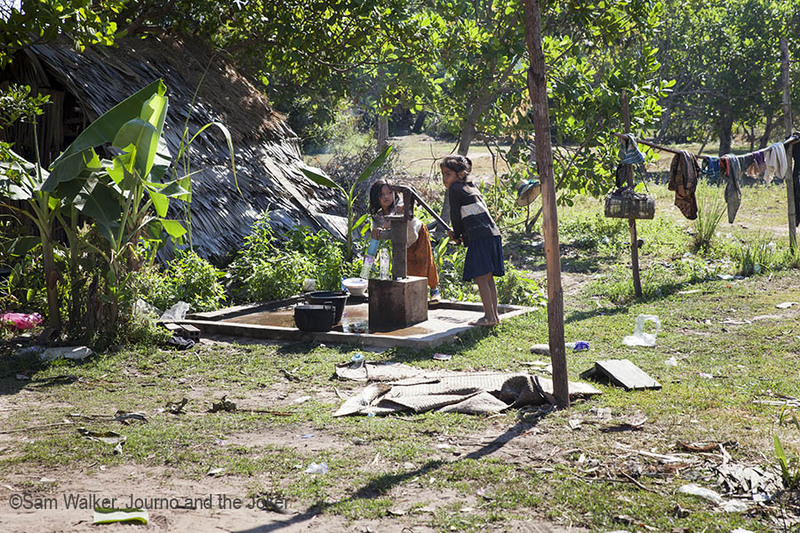 The Khmers are still very superstitious people, especially in the rural areas with beliefs in ghosts and spirits. I love this idea of a photo essay, I really hope there are more to come. Great work in helping this family form a home. I love the look into a different culture and see the goodness of others making a change in strangers lives. There really needs to be more stories like this posted on the web. Hallo Olga. Thank you for visiting. Yes, there are more photo essays to come. They are just quite time consuming and I’ve been swamped in recent weeks. But I hope to get a colourful one of the local market up later this week. I’m so glad you liked this one. It is such a pleasure helping the people here. They really have nothing and they are so grateful for any help you provide.